Well, here is such a picture and aims at explaining the source of some of the mysterious loud booms experienced across the USA! 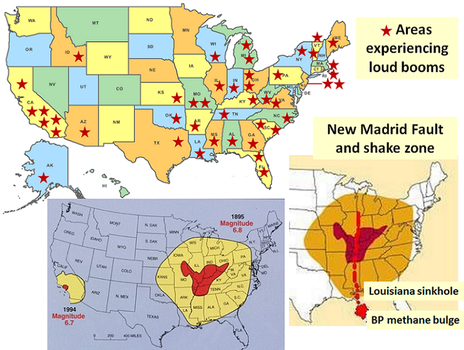 Observe the correlation between the starred areas, representing areas experiencing “mysterious loud booms” and shaking, and the New Madrid Fault and shake zone. This “loud boom” illustration does not include areas experiencing sinkhole development, derailments, explosions, and collapsing buildings, but the states of their occurrence pretty much match the ones shown. The time period covered is January-February 2013. 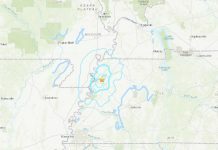 Per the Zetas of ZetaTalk, a major earthquake in the New Madrid Fault zone area will devastate vast areas of the United States and Canada. The New Madrid fault line follows the Mississippi River from Illinois to Arkansas, crossing five state lines – Illinois, Missouri, Arkansas, Kentucky, and Tennessee – as well as the Mississippi River in at least three places. 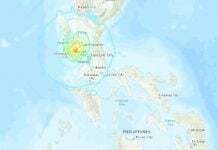 The New Madrid seismic zone consists of a series of faults, including fault lines that run up toward the Great Lakes and from the center of the Gulf of Mexico up the East Coast. 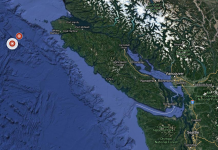 Watch this map of the major US fault lines just to know if you sit right inside one! I’ve always been facinated with the NMSZ. It is not a single fault. It is a fault system that trends SW to NE along the Reelfoot Rift. The known fault system comes from about Paducah KY. to Galveston TX. The New Madrid fault system seems to be a itraplate reverse normal (Compressional boundary. There is evidence of anctien magma intrusions dating back to when the Mid-Atlantic-Rift tried to establish itself here. However, the adjacent rift (now the Mid-Atlantic-Rift) took hold and overpowered the Reelfoot Rift. Based on paleo-siezmic studies, the 1811-1812 series was a very rare event. That even spaned five months with at least 100 shocks, including the three big shocks. Check out Alonzo Dow’s Diary. It includes a letter by Eliza Jane Bryan. She gives a very detailed account from late summer to March 1812. We heard a loud boom last night at 1026pm central time. Feb 07 2015. In Paducah ky. Don’t know where it came from shook the entire house. Sounded like a boom went off next door. Does this map look familiar? It’s the US electric transmission grid, circa November 2012. What happens when a charge of 100+ gigajoules (energy of 100 lightning flashes) is suddenly discarded by the power grid and sent to ground “all at once”? Yeah, it’ll rattle dishes for miles and you’ll have no idea where it came from. Sometimes the grid computers make a mistake and have to throw some away, increasingly so as we build more “long haul” high capacity fiber optic lines that normally idle at 1/3 speed but sometimes jump to full speed during data bursts. Long one terabit cables run around 13,000 volts to power the required fiber optic repeaters, many of which are every 40 kilometers. President Obama moved most of the government data centers to St Louis, MO which now has the highest bandwidth connections in the country. There are a lot of other big data centers, too, including cloud and colocation facilities. Essentially, St Louis is the internet capital of america and is the part of the internet that uses the most variable electricity, specifically when big data centers such as the TSA use “fill the pipe technology” to do off site backups.